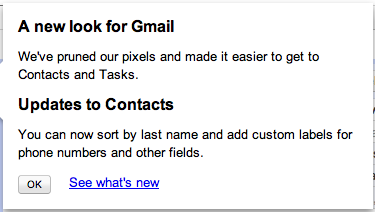 The guys at Google have rolled out a few interface changes for Gmail users. So far, these changes have not been rolled out to Google Apps users. The Gmail interface has been slimmed down to remove clutter and make it easier to find what you need. The result is less links in the left-hand navigation bar and less space used by the select links across the top of the mail pane. The Gmail Contacts application has undergone a major overhaul. One feature I'm going to love is keyboard shortcuts in the Contacts pane. Since you can now see all your contacts in a sort of spreadsheet view, keyboard shortcuts are going to make things a lot easier for me. Additionally, these shortcuts are the same as those found in Gmail. For more details, check out the What's New in Gmail page.